After our week with Christmas themed Tot Activities, we picked up our journey through the alphabet again with the Letter J. The week was filled with a counting activity, fine motor work, tracing, and lots of playtime! 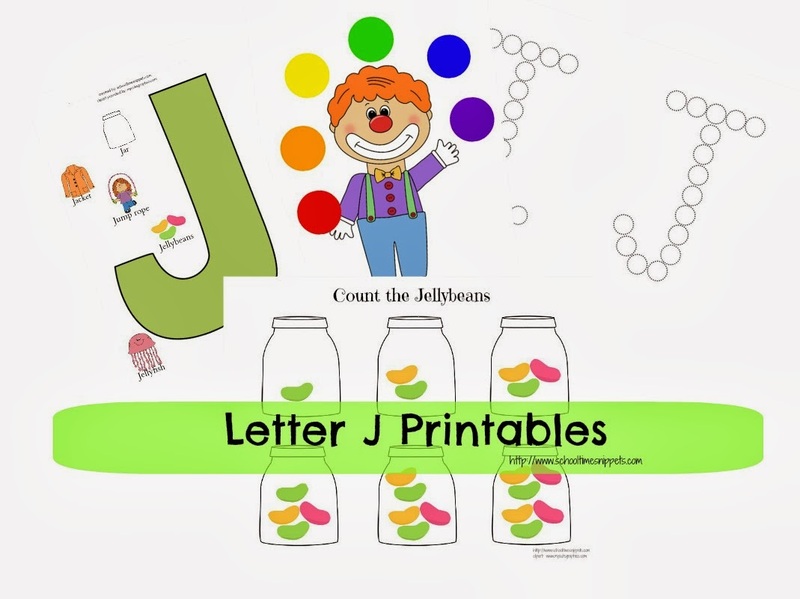 I was inspired by fellow Fine Motor Friday Co-Host, LalyMom's Christmas Pom Pom Drop and created a Juggling Clown Pom Pom Activity for the Letter J. As you can see, all three kiddos LOVED this. I made up the clown printable, glued it onto an empty box, and cut holes big enough for the kiddos to push the pom poms through. We recently bought a whole pack of those dot stickers and I made a Do A Dot activity for her to put them to use; well... one thing led to another and I ended up making a Do A Dot for the whole alphabet! As I am sure I mentioned before, Little Sis is a big big fan of cutting! Not a day goes by lately where she doesn't pull out a piece of paper and scissors and start cutting away. I helped pre-cut some of the white area around the pictures, but otherwise she did it all herself! Little Sis has been very interested in writing "/O, P/" lately. She really does write an "O" when she says that, although I am thinking she means the alphabet. She is great at drawing circles and whenever she "writes" I try to find a letter and write over it with a pen and she gets this huge smile on her face; it is just too cute! Hope we've inspired you to have some fun with the Letter J!